Tucked away on the southern edge of the old Soviet frontier are a series of spectacular cites whose riches have been hidden from Westerners for most of the past century. Khiva, Bukhara, and Samarkand grew fabulously rich off of the trade of the ancient silk road, then fell to obscurity after the opening sea routes to China. Left behind are the spectacular tombs, mosques, and medressas built over the centuries. Not long after modern archeologists began work on studying these sites, the Bolshevik revolution closed off the areas to most Western travelers for the better part of a century. Only in the past decade has a trickle of tourists started to return. This country has the richest history in the region, and includes all three of the cities mentioned above. It's post-Soviet dictator has struggled to find a new national identity, and has replaced Marxist dogma with a reverence for Tamerlane, the brutal Samarkand-based 14th century conqueror reviled in the West. Tamerlane's equestrian statue now features prominently in the capital, Tashkent, and his image dominates the national currency. 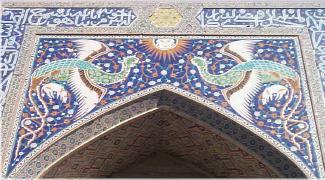 You can see the fantastic buildings financed by his plunder throughout Samarkand. The slowness of the government to liberalize is little more than an annoyance for visitors. Uzbekistan is a cash-only country, with a big difference between the black market and official rates. Trade $200 on the black market, and you'll walk away with a backpack full of Uzbek Sum. This will last you for several days, with mid-range hotels costing $20 per night, and restaurant meals running about $2. Be sure to save the visitor cards given by the hotels, though -- the pesky Uzbek border guards are empowered to check up on where you've been. Khiva is a perfectly intact walled city with spectacular tilework and a thriving tourist industry. Don't expect to see much traditional life here -- virtually all of Uzbekistan's historical sights have been transformed into somewhat sterile museums. But this doesn't detract from the great beauty. Bukhara is a bit more lively, while remaining historic, and Samarkand is a big city with sites scattered amongst modern development. Fortunately for travelers, Uzbekistan's transportation infrastructure helps bridge the gap between the long distances in the large country. Uzbekistan Airways offers flights from Tashkent to Khiva for less than $100, and good roads mean the long trip from Khiva to Bukhara is only 7 hours. Hiring long-distance taxis is the preferred way to go. A car and driver will cost only about $40 for the day. The food in Uzbekistan is very enjoyable, provided that you love lamb. Otherwise, you're pretty much screwed. This is true for the entire region, except the large cities with restaurants serving international cuisines. Kyrgyzstan is much more westernized than Uzbekistan, and Russian is spoken as often as Kyrgyz, especially in the capital of Bishkek. There, you can go bowling, have a cocktail in a swanky club, and dine in countless outdoor cafes with cuisines from around the world. Once you leave the Russified capital, the country is much more traditional, with a countryside dotted with traditional tents called yurts. The formerly nomadic Kyrgyz settled only after the imposition of Russian rule, and many return to their roots in the summer to herd sheep. Visitors can have a great experience staying in family-owned Yurts affiliated with the Shepherd's Life organization. One of the best spots is near the old Silk Road fortress of Tash Rabat near the Chinese border. Also in Kyrgyzstan is the beautiful and huge lake Issyk-Kul. The salt water lake is so enormous you can barely see the snowcapped peaks on the other side. A series of beach resorts line the shore on the northern edge. The outrageously high prices cater to the country's tiny class of nouveaux riche. One of the largest of the Soviet-era resorts is the Aurora, with a huge concrete building shaped vaguely like a the Bolshevik-era ship from which the resort gets its name. The manicured grounds here are spectacular, with a beach to rival any in the temperate world. It's enough to make you feel like a real-life member of the nomenklatura. Of the two border crossings open between Kyrgyzstan and China, the Torugart Pass is the most difficult and adventurous. The elevation is so high that breathing becomes labored. Onerous regulations mean that crossings must be arranged through expensive tour agencies in Bishkek or Kashgar. Passenger vehicles are not even allowed to cross -- travelers must walk across the frontier to go between their Kyrgyz-based vehicle and their Chinese-based vehicle. The wait at the treeless frontier, when combined with the multiple checkpoints on each side of the border, make this a tediously slow trip. The alternative is the Irkeshtam Pass, which opened in mid-2002. It is at a much lower elevation, and allows vehicles to cross, provided passengers have valid visas. A simple trip to the International Bus Station in Kashgar with $50 will buy a one-way ticket to the southern Kyrgyz city of Osh on a crowded sleeper bus. The 20-hour trip is long and boring, including multi-hour waits at the border, but a much simpler, easier and less expensive journey than going across the Torugart Pass. The old city is a jumble of narrow alleyways between simple mud-brick homes that probably haven't changed much in centuries. It's populated by the Mediterranean-looking Muslim Uighurs that are besieged by the immigrating Chinese that have surrounded them with a modern and ugly concrete city. English-speaking visitors may have trouble communicating with a population whose first and second languages share no Indo-European roots, and have no use for Latin characters. In restaurants, be prepared to point, while praying that what you get isn't tripe. These varied cultures bloom at the Sunday market, one of the noisiest and most rambunctious places in the world. People come from Pakistan, Han China, and all parts of the surrounding Chinese Turkistan region on donkey carts, camels, motorcycles, tractors, and the omnipresent red taxi with its horn blaring. 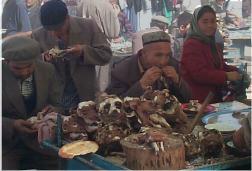 There's not much for the Westerner to buy at the market, but the sight of crowds of men gnawing on roasted sheep's heads at a lunch cart leaves a lasting memory. 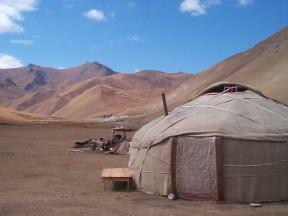 David G. Young and Aisuluu Bedelbayeva spent three weeks traveling in Kyrgyzstan, Chinese Turkestan, and Uzbekistan in September 2002. Browse the complete set of photos from this trip.